Baack (2012) discloses in his book, Organizational Behavior, that artifacts are the overtly stated values and norms that identify individuals and organizations (Baack, 2012). Individual artifacts include the car a person drives, the clothing and jewelry they wear, piercings and other forms of items of value. These artifacts transmit nonverbal messages or kinesic cues that are communicated in a nonlinguistic way. 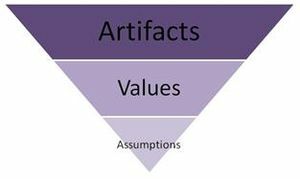 An organization’s culture on the other hand, is determined by the observable artifacts. They represent the physical signs of an organization’s dominant culture, like the golden arches of McDonalds. The most significant observable artifact at Capitol-EMI Industries, my former place of employment is the historic Capital Records Tower building in Hollywood. Like McDonald’s golden arches, the Capitol Records Tower is instantly recognized by the unique design which represents a stack of record discs. As a newly hired employee, I was fascinated with the design of a round building. It’s one thing to marvel at it from the outside, but another experience entirely from within the tower walls. The offices I worked at were located on the eleventh floor, so the views from that height were magnificent. When the Paramount Studios lot caught fire from the set of one of the Star Trek movies, we were able to view it from the office bay windows. It wasn’t until I was promoted and transferred to the EMI offices down the road that I really began to appreciate the tower building. Although I was content to find employment in a smaller one story structure, where our executive offices were located, I look back now at the tower with fond memories. The Capitol Records culture was transmitted in a variety of ways through the espoused values which include emphasis on sustainability and a commitment to high quality entertainment. The combination of observable artifacts which includes the company brand and logo, the tower building, and the catalog of famous artists, along with the espoused and enacted values helped create role clarity for the employees. For example, the lobby of the building displays many gold records from artists including: The Andrew Sisters, Frank Sinatra, The Beatles, The Beach Boys, Nat King Cole, Neil Diamond, Bob Seger, and Tina Turner. The personnel who work at the tower encounter these observable artifacts every day that gives staffer a sense of pride. Many of us grew up listening to these artists and were proud to be a part of such a prestigious family. 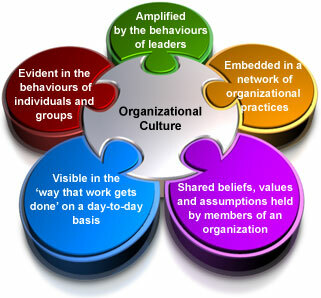 Schein (2010) contends the connection between leadership and culture is clear in organizational cultures and micro-cultures. Managers influence the behavior of the subordinates. Those who are resistant to change do not last very long. (Schein, 2010). For example, when I was initially hired, I had just relocated from Arizona where I grew up. I had not resided in California long enough to adapt and blend in with the Southern California culture which was entirely different from that of a desert state like Arizona. My sense of style reflected that of a conservative small town. In fact, I recall one individual compare my fashion style to that of an airline flight attendant, which translated as professional, but not very hip. The dress code varied from floor to floor and department to department. For example, the executive offices where the CEO and high ranking officers worked (all male) and each dressed in suit and tie, while their administrative staff were dressed in professional accouterments that reflected their executive office. The floor where the A&R (Artist and Repertoire) and R&B (Rhythm and Blues) departments were located (where our Business Affairs division was also situated) the executives attire resembled that of the artists they represented. For instance, the executives who signed the rock bands dressed like the rock stars; the executives who signed the rap artists looked like rappers. I was employed with the attorneys that negotiated the artist contracts and eventually adapted a style that blended with the norm of the support staff on that floor, which consisted of a combination of those from the A&R department and the executive offices upstairs. It was a professional style but appropriate for the LA music scene. The espoused values and assumptions both helped and hindered moving the company into a learning organization. Executive leaders learned to work together cohesively and in tandem to achieve company goals, but at times engaged in conflicts from policies and actions that were not always supportive. For example, when an artist’s profits and popularity soars after their initial debut album, the artist’s manager and attorney immediately look to renegotiate the contract. The department head of A&R must decide to either go up against manager and artist and refuse their requests, or face the other executive branches to keep in alignment with the artist. It is here the negotiation process begins pitting company leader against company leader as the artist’s camp engages into debates with the policy holders. Each incident becomes a learning experience as each situation is unique and no two artists are the same. Our department became involved when contractual questions or disputes arose so that we could either arm the A&R executive or some case, deflect the A&R department from operating outside the parameters of the contractual commitments. As a rule however, the members of the Capitol Records family enjoyed a positive culture of stability. The recognizable observable artifacts, perceptions of espoused and functioning enacted values, helped generate a greater sense of clarity for the personnel.